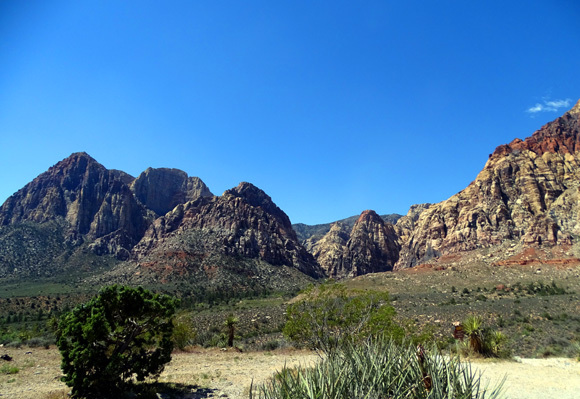 areas, picnic areas, and access to dozens of day hikes and trails . 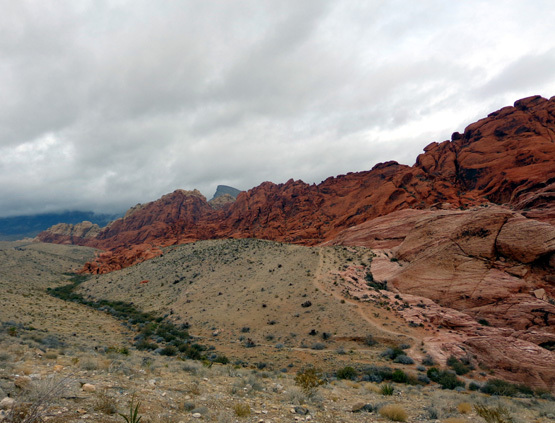 . ."
Southern Nevada Conservancy in partnership with the Bureau of Land Mgt. 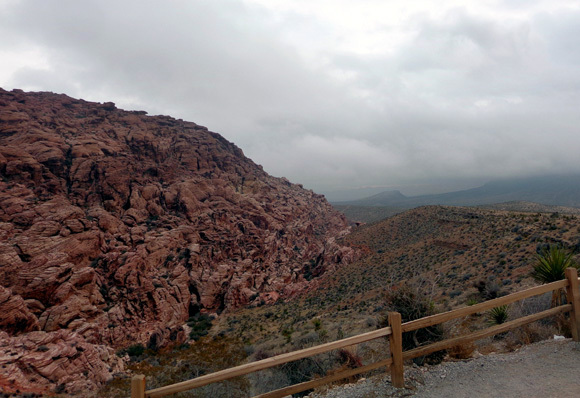 We visited this 200,000-acre conservation area in April, 2016 and enjoyed it enough to want to explore more of the trails during our visit to the Las Vegas area this month. I'm glad we got to see inside the visitor center three years ago because it was closed this month due to the partial government shutdown. 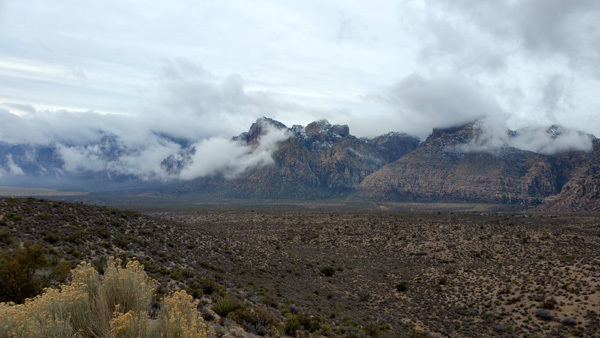 Despite the shutdown, however, today some people -- volunteers with the Southern Nevada Conservancy perhaps? -- were manning the gate, cleaning the restrooms, and picking up trash, jobs that have not gotten done in most of our national parks, recreation areas, and conservation areas since the shutdown began in December. Even though the visitor center was closed today, we were able to get a new visitors' guide with maps at the entrance station. We had our old guide with us just in case. 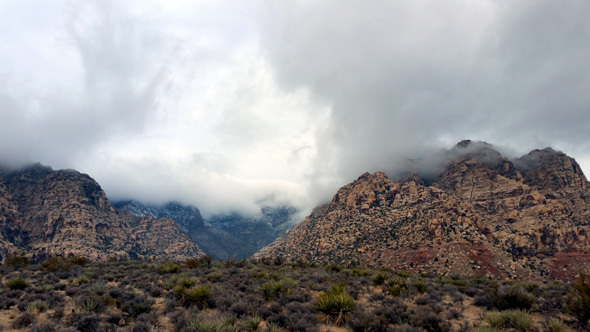 Today was a chilly, overcast Monday with low clouds hanging over the mountains so we thought we'd practically have the place to ourselves. Not! While there were fewer people in the park than during our warm, sunny day in April three years ago, we were surprised to see as many visitors as we did. 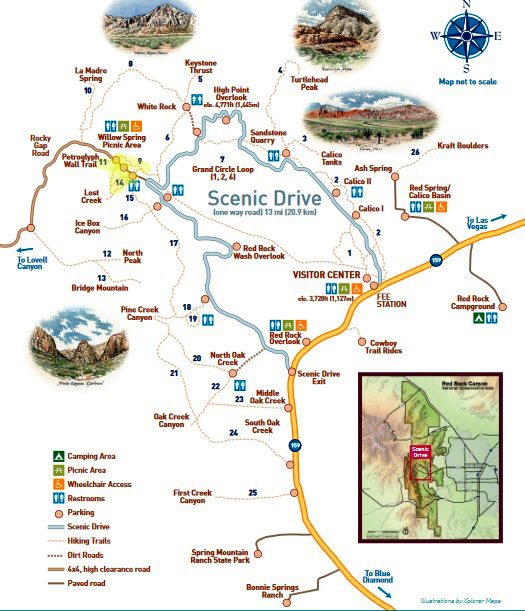 I put a red dot where the scenic drive and trails are located. 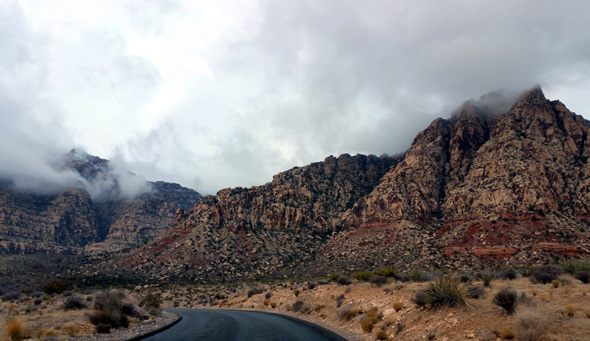 Red Rock Canyon has an entrance fee unless you have one of the various types of national park passes. We got in free with our senior NPS passes. 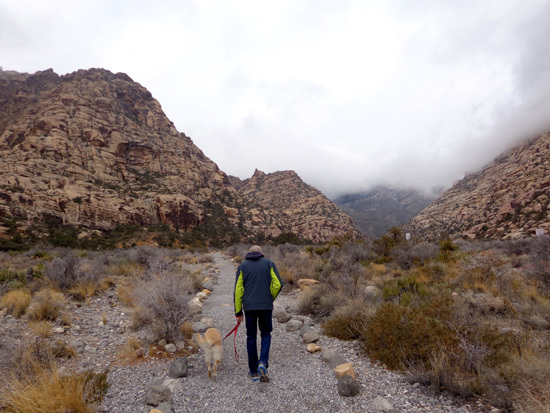 Leashed pets are allowed on the trails and at the parking areas and overlooks. Park officials strongly advise against leaving pets unattended in vehicles because they can quickly heat up even on sunny winter days in this climate. 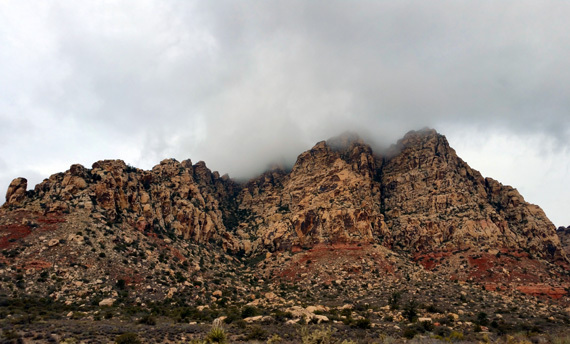 Neither heat nor cold were a problem for us today, with low-hanging clouds and temps in the 50s. 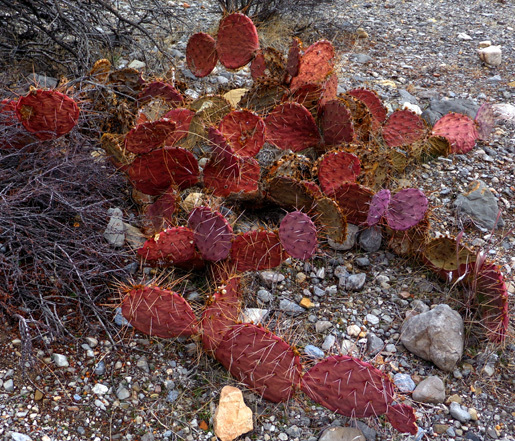 The park's high, dry desert terrain can be dangerous for humans, too -- very hot in the summer, very cold in the winter, depending on where you venture. 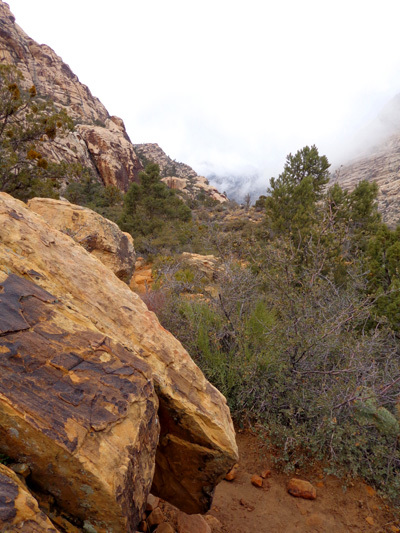 Elevations at Red Rock range from about 3,500 feet in the canyons to 8,150 feet at the summit of La Madre Mountain. Very few people go up to the summit, however. 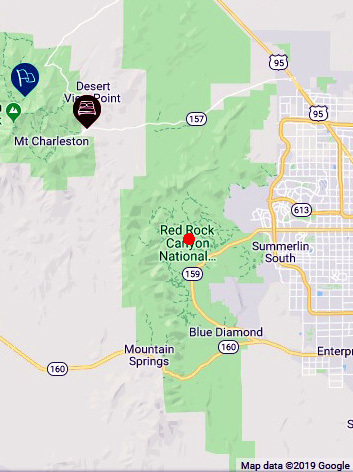 Most do go to (or past) the visitor center (3,720 feet elevation) and the High Point Overlook on Scenic Drive (4,771 feet elevation). You can see a more legible version of the map on the internet at that link. 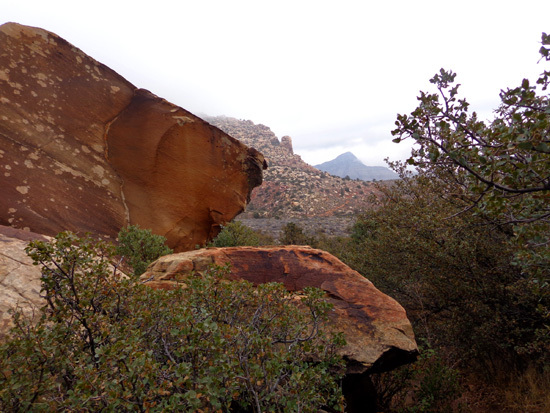 I highlighted in yellow the trails we hiked today, a distance of about two miles at Lost Creek and Petroglyph Wall. 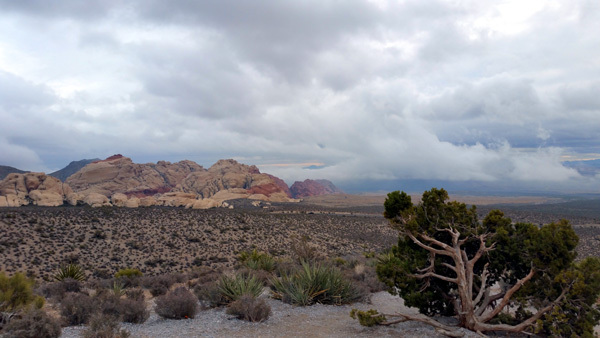 If you have only a short time available at the park, the two most important things to do would be going to the visitor center to get a map and learn a little about the history, geology, and wildlife in the park, then drive the 13-mile long Scenic Drive loop, stopping at overlooks and parking areas to gaze and take photos as time permits. If you have more time, by all means get out and explore one or more of the trails. 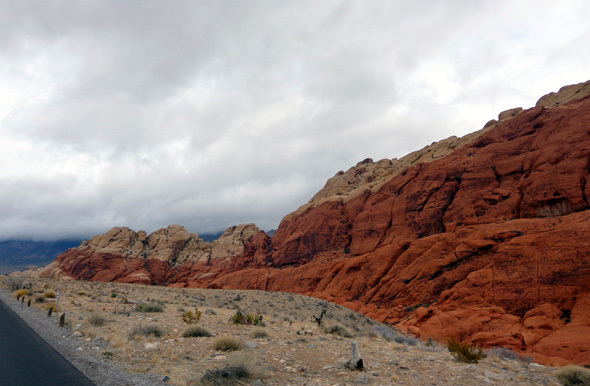 The visitor guide describes at least 27 of them around the loop and farther south on NV 159. 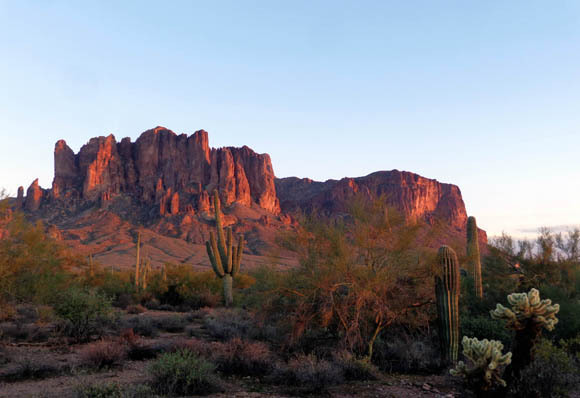 The trails range from easy to strenuous based on the terrain, elevation gain and loss, and distance (from less than a half mile up to 14 miles). 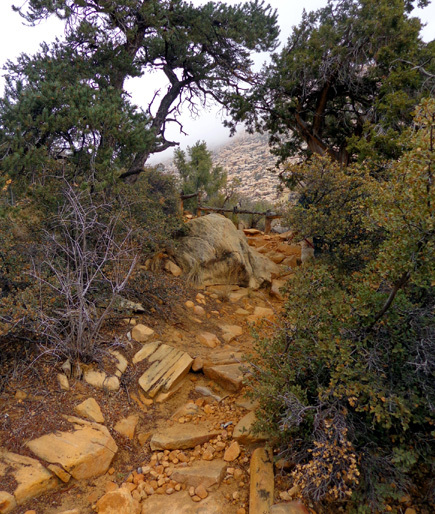 Trails can be hiked singly or combined into various configurations for longer treks. 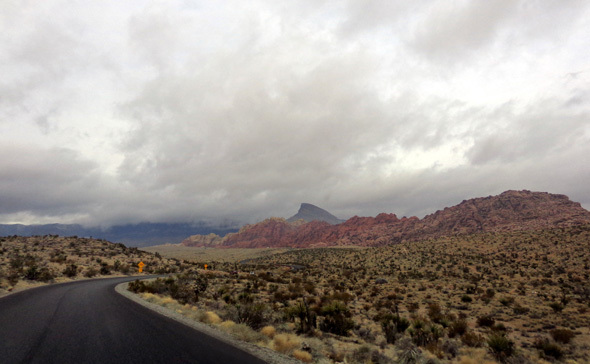 This nice paved road begins at the fee station just off NV 159 and is one way CCW. It meanders for 13 miles in an elongated sideways U-shaped loop past the main features in the middle of the conservation area and ends a few miles farther south on Rt. 159. 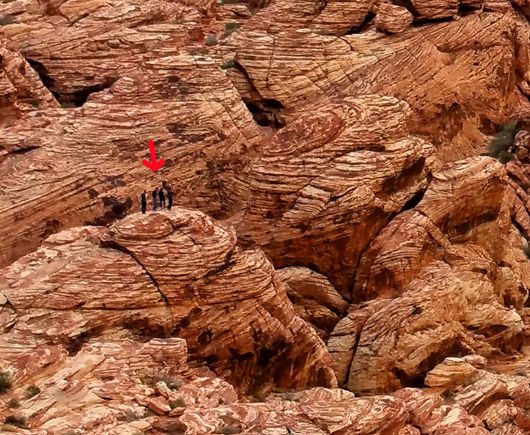 You can see it clearly on the trail map I showed above. 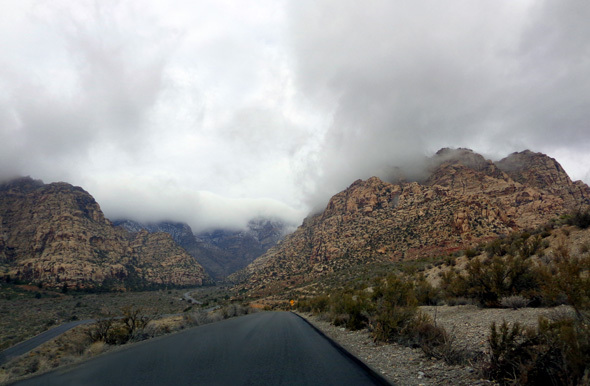 Scenic Drive is wide enough to be safe for cyclists to use the road in the same direction as traffic. If I was running or walking on the road I'd want to go the other direction, however, so I could see traffic coming toward me. Look carefully at your map and drive slowly so you don't miss any turnoffs. 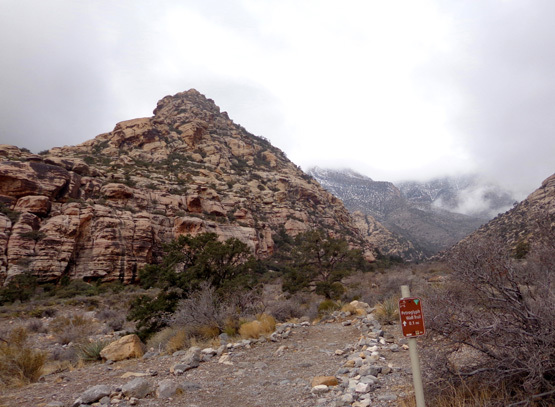 If you miss a trailhead, you can't just turn around and go back -- you have to complete the loop and start over! You don't have to pay again, though, if you do it the same day. 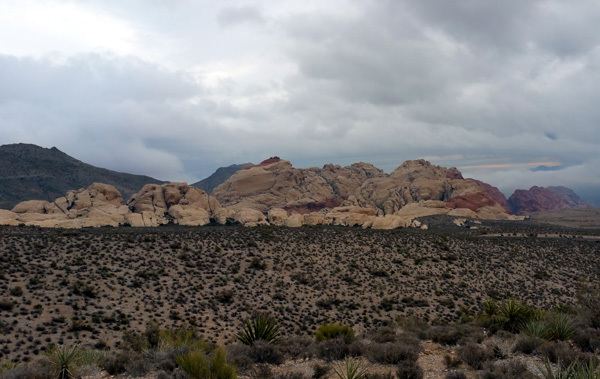 Today was overcast, with low clouds that give a much different "atmosphere" to the place than the completely sunny day when we visited in 2016. The colors were much more muted today. 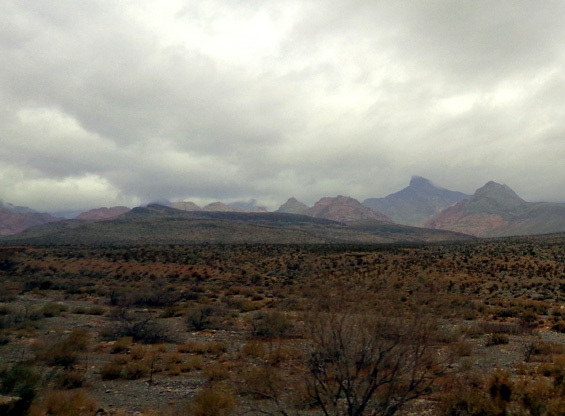 The far end of the Scenic Drive loop courses below Turtlehead Peak, the White Rock Hills, Keystone Thrust, and other mountains. 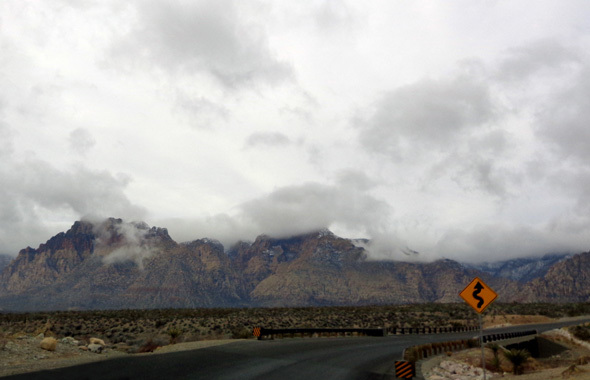 Clouds obscured some of the peaks but made for some interesting pictures today. We stopped to soak in the panorama and take some photos at the High Point Overlook about six miles into the loop . 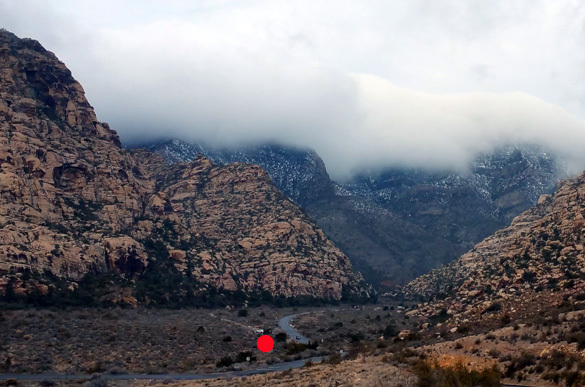 . .
We parked near the red dot for our hikes. A little more than halfway around the loop we turned right at Rocky Gap Road, which is paved for about a mile back to the pleasant Willow Springs Picnic Area and continues as a dirt road farther south to some other trailheads. You can see the road in the picture above. 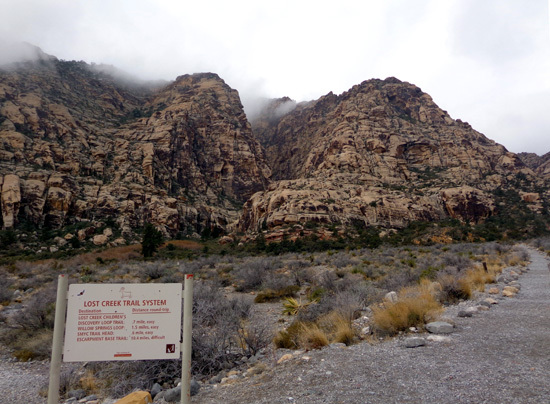 Four trails start in this area before the pavement runs out: Willow Spring loop, SMYC connector trail (I don't know what those letters stand for), Lost Creek/Children's Discovery Trail, and Petroglyph Wall Trail. 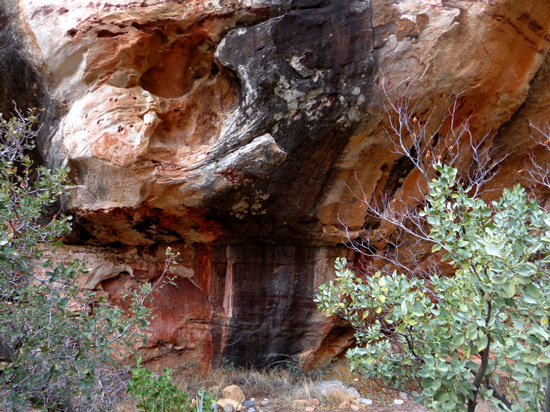 I think there might be a petroglyph in these rocks but it may have been grafitti so I won't show it here. 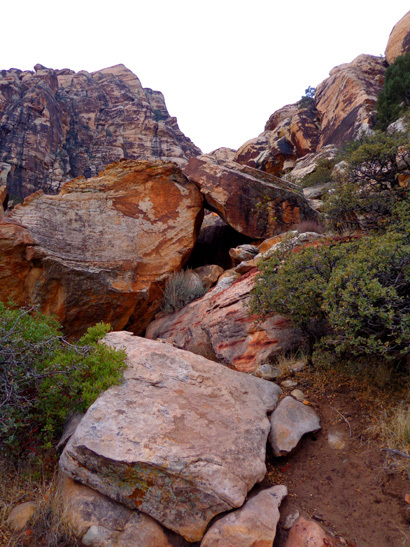 We continued farther up the road to the trailhead for the Petroglyph Wall Trail across from Willow Spring picnic area. 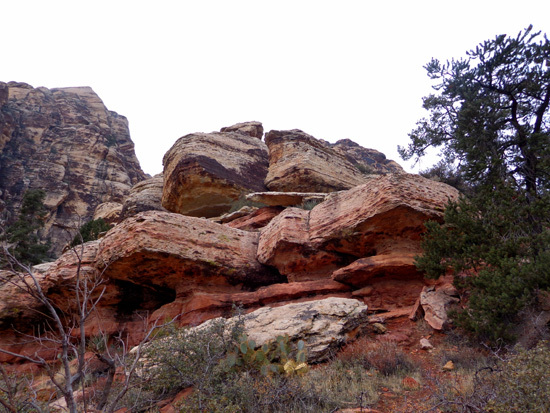 We hiked the short and easy trail out and back. 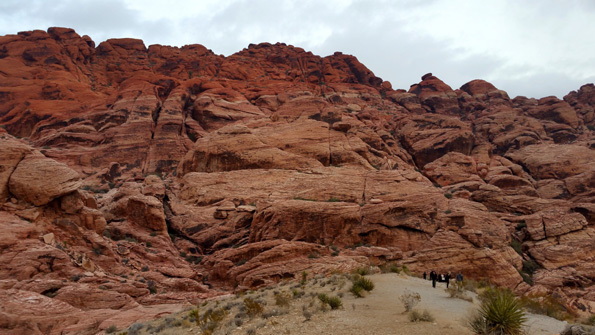 There are many more petroglyphs at Valley of Fire State Park and they are much easier to spot. I'll show some of them in the next entry. 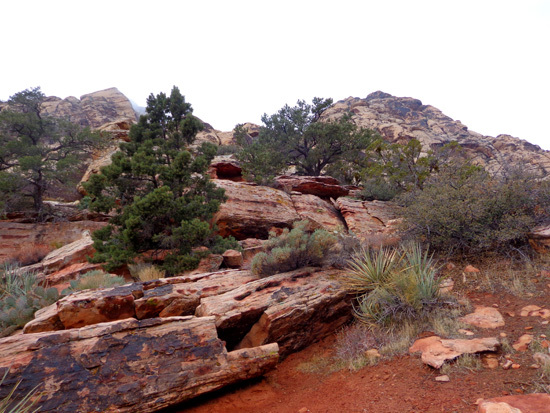 Desert bighorn sheep frequent the rocks above the Willow Spring picnic area but we didn't see any today.